Last month the cycling world went crazy and forced Specialized to backdown over their attempts to stop a small bike shop in Canada using “Roubaix” in its name. 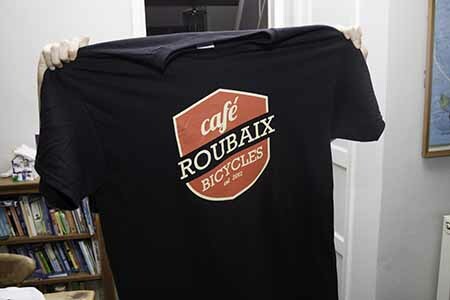 As a show of some considerable solidarity with Cafe Roubaix lots of cyclists went online and bought t-shirts from the shop… and today mine has arrived. Since placing my order for the shirt, Specialised have now apologised to Cafe Roubaix and have removed the threat of litigation (even though there has been some considerable discussion as to whether or not Spesh had the right to attack Cafe Roubaix on this copyright issue anyway). It’s great news and I’ve now got my shirt to continue for a small shop in Canada!